Early Learning Centre Wooden Click Clack Cars Track. suitable from 12 months bright and colourful track includes 3 cars watch as they rush down the track Product Information Put a car at the top of the track, and watch it click and clack its way down the colourful tracks. We can send one car down at a time, or set them off one after the other. Try starting the cars off wherever you like, and in any combination: start one halfway down and another at the top at the same time, or leave one at the bottom and see if the other car pushes it off the track. In excellent used Condition. From a smoke and pet free home. Please see my other items. Im not sure if this set is complete its just what you see. Several lovely, Early learning Centre Wooden Toy vehicles. A fab selection of Early learning Centre Wooden Toy vehicles with a few other's by different manufacturers. Including Bus, Petrol Tanker, Fire engine, Milk float, lorry and a sports car. ELC Big City Wooden Garage. Sturdy, wooden garage. Wind-up lift. Great for playing with friends to boost social and communication skills. Pretend play boosts imagination. ASSORTED FARM ANIMALS. LARGE TRACTOR with SOUNDS (PRESS DOWN ON DRIVERS SEAT). ELC Happyland light and sound cement mixer. Nice used condition. With 4 KNIGHTS 2 HORSES. OPEN UP SIDES TO EXPAND. Early Learning Centre ELC Big City Carry Along Centre with 6 Cars and 1 fire engine. In good condition see photos, but missing 1 traffic lights, big city sign and small yellow/white striped sign. Includes 6 cars and a fire engine to get you started. Open helipad to reveal extra storage space. Open the roof to reveal storage space. FLOWER and VEG STALLS ( NO PRODUCE SOLD OUT). POLICE STATION with 3 DIFFERENT SOUNDS (BUTTONS ON TOP). 9 ASSORTED MAGNETIC VEHICLES in EX CONDITION. TRAIN / CARRIAGES. BREAKDOWN LORRY / CONSTRUCTION VEHICLES. 9 ASSORTED MAGNETIC VEHICLES in EX CONDITION. TRAIN CARRIAGE /CONSTRUCTION VEHICLES. IN THEIR SCHOOL BUS / SCHOOL CHILDREN /BUS STOP SIGN. E L C -- MIXED LOT. Early Learning Centre Pink Lights And Sounds Buggy Driver. Condition is New. With lights and sounds. Encourages your child to look, listen and touch, experiencing the world with their senses. ELC Convertible Car from year 2000 - ELC123. car is push along, batteries only work the sounds. has four number buttons that make sounds. ELC Big City Toy Garage with Portable Carry Box Emergency Centre and Ramp For sale. Get a bargain with all of this for the price shown. The product is used and shows some wear as can be seen in the photos but is fully operational. Collection in person please and cash required on collection. Please ignore requests from eBay to pay via PayPal. Needs to be collected within one week of successful bid. Colourful, robust and inspiring toys which are great for imaginative play. There are three garage doors and when you lift a door, lights flash and sirens go off as the vehicle whizzes out. There are three vehicles - police, fire and ambulance. Collection only from NE13 due to the size of the item. 1 LARGE PINK CAR . TOY BOX COLLECTION. In excellent condition and fully working. Cost £30 new - grab a bargain! Good condition Made of Plastic makes sounds and light ( Truck Only) This Toys has been played with. ELC Magnetic Vehicle Bundle x12. 2x Ambulance. 2x Tow Truck. 1x Race Car. 1x Fire Engine. Great condition garage alone was £50. Bought separately the carry along city worth £40. Slight mark to a floor sticker shown in pic and one grey column missing/ petrol rubber hose ha detached. but no effect to play. I have included two cars and the city bus too. Bought from the ELC.Has car lift and heli pad which makes realistic sounds. Pet and smoke free home Due to size collection only. Thanks for looking. 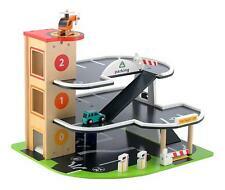 ELC Whizz Around Garage car inspection ramp in red. Ideal replacement if you garage is missing this part. Sadly the electrics didn't work on my sons garage, so I am selling some parts as they are in good condition. Please feel free to ask any questions. Collection welcome from Paignton TQ3 area. I am happy to combine shipping where possible. Please ask for a quote. From a smoke free and pet free home. Have a look at my other items for more great bargains. Use the battery powered driver to build and unbuild you racing car. upto 5 kg £7.50. upto 2kg small parcel £4.50. ELC Whizz Around Garage car inspection ramp in orange. Ideal replacement if you garage is missing this part. Sadly the electrics didn't work on my sons garage, so I am selling some parts as they are in good condition. Please feel free to ask any questions. Collection welcome from Paignton TQ3 area. I am happy to combine shipping where possible. Please ask for a quote. From a smoke free and pet free home. Have a look at my other items for more great bargains. Early Learning Centre Big City Garage and spiral ramp, with separate carry along city which connects with the garage but can also be played with separately and stored in its own carry along case. In very good used condition, from a smoke and pet free home. Collection only from Harpenden, Herts. ELC Whizz Around Garage Helipad / battery cove in yellow. Ideal replacement if you garage is missing this part. Sadly the electrics didn't work on my sons garage, so I am selling some parts as they are in good condition. Please feel free to ask any questions. Collection welcome from Paignton TQ3 area. I am happy to combine shipping where possible. Please ask for a quote. From a smoke free and pet free home. Have a look at my other items for more great bargains.